Plan your vacation at the Prince Resort and enjoy all the top-notch amenities that make the Prince one of the most popular resorts on the Grand Strand. Enjoy the Ocean Drive Difference by starting your vacation immediately upon arrival, as this property comes with fresh bed linens/bath towels, the beds are already made up for you, and the departure maid service are all included in your price. Modern furnishings, pleasing colors, spacious interiors, and spectacular ocean views greet you as you step into this luxurious two-bedroom condo. This property has enough room for the whole family! Prince 1133 features a big master bedroom with king bed and private bath, and second bedroom with two full size beds. The full size kitchen makes it easy to prepare meals and enjoy them while watching the beautiful Carolina sunset from the large balcony. 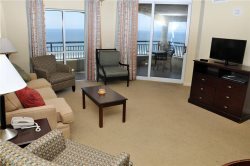 The view from this second row condo is so great, you'll swear you're staying oceanfront! Keep up with the laundry without leaving the condo; the washer and dryer are yours to use while you stay. Book your trip to the Prince Resort today! Extra bonuses include free parking, unlimited use of amenities and on-site restaurants, convenient location, and all the savings of our own Endless Fun Club!